Iosif Vissarionovich Stalin, Chairman of the Council of People's Commissars of the USSR, was born December 6 , 1878, Gori, Russia. The greatest Soviet dictator for about 30 years and undisputable leader of the Communist Party from the late 1920s, Georgian revolutionary Iosif Dzhugashvili (3) joined the Russian Social Democratic Workers' Party in 1898. He went into political underground in 1901, where he was better known as Koba and later Stalin (c. 1913). At the 2nd party conference in 1906, Stalin met with Vladimir Ulyanov (Lenin) and became one of his ablest aides. Exiled for revolutionary activities, he did not participate in the Prague conference (Jan. 1912), which confirmed the emergence of the Bolshevik party, but he was co-opted onto the Central Committee as a full member (1912 - March 5, 1953). After a four-year exile in Siberia, Stalin returned to Petrograd in March 1917 and resumed his seat on the Bolshevik Central Committee and in the editorial board of Pravda. On October 10 , 1917, Stalin became a member of the Political Bureau, but this body did not outlast the Bolshevik coup. In the first Soviet government Stalin took portfolio of the people's commissar for nationalities (Oct. 27 [Nov. 9], 1917 - July 6, 1923). During the Civil War in Russia, Stalin worked as a head of the food procurement commission and actively participated in the defense of Tsaritsyn (in 1925-1961 Stalingrad) in the summer of 1918. The same year he entered the Revolutionary Military Council of the Republic (member: Oct. 8, 1918 - July 8, 1919 and May 18, 1921 - Aug. 28, 1923). A major reorganization of the Bolshevik party structure resulted in Stalin's appointment as a full member of the Politburo and Orgburo (membership in both March 25, 1919 - Oct. 5, 1952). He was also nominated people's commissar for state control (March 30, 1919 - Feb. 7, 1920) and then served as people's commissar for workers' and peasants' inspection (Feb. 24, 1920 - Apr. 25, 1922). However, his accession to the top leadership began with his appointment (Apr. 3, 1922) to the party secretariat in the capacity of General Secretary (4). 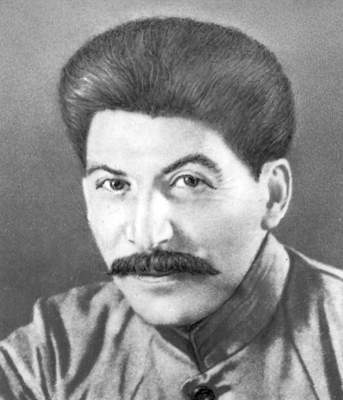 Using the secretariat as a base for his struggle with other party leaders, Stalin gradually succeeded in expelling his rivals from the party. At the first stage, he joined with Lev Kamenev and Grigory Zinovyev to oust Leon Trotsky, who was removed from the key state posts in 1925. But the triumvirate broke away in Dec. 1925, when Kamenev and Zinovyev were condemned as members of the "new opposition" at the 14th party congress. In 1928 Stalin put an end to the New Economic Policy, which made some concessions to capitalism, and appealed for rapid industrialization and collectivization of agriculture. His former allies, Nikolay Bukharin and Aleksey Rykov, who favored moderate transformation of Soviet economy, were labeled the "right opposition" and purged from the party elite. By 1929 Stalin's major opponents were defeated and he launched the first in a series of five-year plans to intensify economic development. Collectivization did not produce positive economic results remotely comparable to those attained by industry. Prosperous peasants (kulaks) were exiled and sent into concentration camps en masse. By the mid-1930s Soviet Union became a world power, where Stalin's cult of personality penetrated into all spheres of public life. A small circle of his closest supporters in the Politburo directed all activities of the Soviet Union, while the rest of the party collectively approved the "party general line." However, the old Bolsheviks became the next target in a campaign against "enemies of the people." The murder of Leningrad party boss Sergey Kirov in Dec. 1934 triggered a wave of political purges reaching apogee in 1937-1938. The reign of terror and omnipotent NKVD (secret police) formed the basis of Soviet society. In 1939 Stalin and Molotov concluded the non-aggression pact with the Nazi Germany. In 1939-1940 Soviet Union acquired vast territory of eastern Poland and annexed the Baltic states. As the Soviet Union was making preparations for war in Europe, Stalin assumed the office of chairman of the Council of People's Commissars (May 6, 1941 - March 15, 1946). During the war with Germany, Stalin concentrated full political and military power as supreme commander-in-chief and chairman of the State Defense Committee (June 30, 1941 - Sep. 4, 1945). He was also made people's commissar for defense (July 19, 1941 - Feb. 25, 1946) and subsequently commissar for the armed forces (Feb. 25 - March 15, 1946). Stalin actively took part in elaboration of military operations and proved to be able negotiator in the Allied meetings. The war was won and on June 27, 1945, Stalin was made generalissimo of the Soviet Union. In March 1946, the Soviet political structure was slightly changed and Stalin assumed the new office of the chairman of Council of Ministers (March 19, 1946 - March 5, 1953) and minister of the armed forces (March 19, 1946 - March 3, 1947). The short period of relaxation ended up with new show trials in early 1950s (Leningrad affair, doctors' plot). In 1952 Stalin convoked the 19th party congress and initiated changes in the party charter and structure. Apparently, he planned to launch a new purge within the party leadership, but on March 2, 1953, he was found in coma at his dacha in Kuntsevo. While Stalin was still alive, Malenkov and Beria rushed to convoke a party forum (joint session) on March 5 to approve their leadership. Malenkov took over the chairmanship in the Council of Ministers and Beria became first deputy chairman and internal affairs minister. According to official information, Stalin died at 9:50 p.m. on March 5, 1953. Notes: (1) Birth register of the Uspensky church in Gori fixed the day of Stalin's birth on Dec. 6 , 1878, though he maintained himself that he was born on Dec. 9 , 1879. (2) According to the Soviet Constitution of 1936, the government's term expired during the first session of a newly elected Supreme Soviet. Accordingly, Stalin and his government resigned on March 15, 1946, and on the same day he was asked to form a new government. He formed it on March 19, but in a new capacity of the chairman of the Council of Ministers; the law "On transformation of the Council of People's Commissars of the USSR into the Council of Ministers..." was adopted by the USSR Supreme Soviet on March 15, 1946. (3) Original name: Iosif (westernized Joseph) Vissarionovich Dzhugashvili; (4) Elected on Apr. 3, 1922, Stalin remained a secretary of the Central Committee until his death. In the period of 1922-1930, the Central Committee usually issued a formal approval of his position as general secretary, but after the 17th party congress it stopped making such approvals. Stalin neither resigned the post and had not been dismissed, so it is rather questionable whether he considered himself the general secretary in 1934-1953. The party documents signed by Stalin normally indicated his post as sekretar' TsK.